Bioware Pledges to Patch TOR "Almost Every Week"
Bug-fixes and exploit corrections are the number one priority. The launch of a major MMO is a serious undertaking. There are so many moving parts in the code - from server issues to client-side bugs - there are bound to be some problems. No amount of testing, and The Old Republic had a lot of testing, would have been able to squash them all. Now that the game is officially live and is a constant topic of discussion in The Escapist, a few nagging glitches have come to the surface. BioWare's Game Director on The Old Republic James Ohlen is committed to patching the big problems ASAP while keeping a steady stream of patches to fix more minor bugs and balance issues. 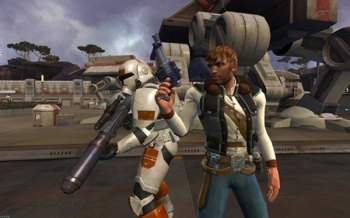 "Any game as big and as complex as The Old Republic will have bugs," Ohlen said in a post on BioWare's official forums. "We're working as hard as we can to find, fix, test and patch the game to eliminate as many of them as possible. "Almost every week we will be releasing a new patch. These weekly patches are almost entirely focused on bug fixes, minor balance changes and fixing any exploits in the game. These issues are the highest priority items at the studio," Ohlen said. "These issues are the highest priority items at the studio." Unfortunately, patches have to go through their own testing process to make sure they don't break the game even further. "[Patches] are reviewed by senior leadership on a daily basis. Bug fixes usually take longer than a week to get into the game because we need to fix the issue and then test the fix. Some bugs take longer than that because of the complexity of the issue." Ohlen reserves his red button to patch a bug immediately only for issues that cause a huge problem for the entire player base. "There are issues that we will fix immediately. These are rare and not every issue can be fixed in this manner. We usually reserve these 'emergency fixes' for bugs that are stopping players from playing the game or to exploits that could unbalance the entire game if not corrected." Taken as a whole, there have been a relatively few problems with the launch of The Old Republic as compared to other MMOs. Even WoW dealt with horrible server queues and fun-sucking lag for the first six months of life or more. A few dancing glitches and a some crowded server queues are like a Bantha fart compared to WoW's launch.